The one-and-done Kentucky stud needed an A in a certain high school class to be academically eligible for college. The grade report shows he made a C average. What gives? 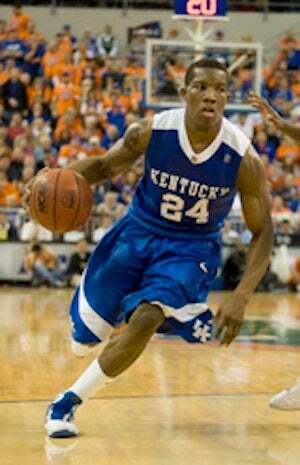 Bledsoe took Algebra 3 in night school as a senior at Parker High School in Birmingham. Based on his ACT score and his GPA, nothing less than an A in that class would have made him eligible to play for the Wildcats. He got that A, maybe. His transcript shows he received a 90 in each of the two class sessions, averaging to an A. But the Birmingham News reports that the grade report from that class shows he scored a low C in one session, and a low B in the other. "You've got the wrong grade," the algebra teacher told the reporter, before hanging up. And maybe they do! Maybe it's a typo. Maybe this is all on the up-and-up. Then you learn that Bledsoe "aced" Algebra 3 before taking Algebra 2. He pulled an A in that class too, even though he had never scored higher than a C in any math class before attending Parker High. The NCAA's investigating. It's a good thing Kentucky doesn't hang Elite Eight banners at Rupp Arena. Because last year's might not stay up for too long.